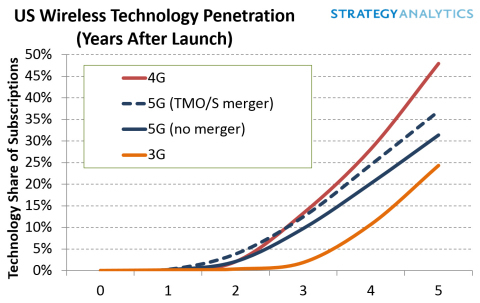 The Strategy Analytics’ Service Provider Group new report, “US Wireless Outlook: T-Mobile/Sprint Merger Accelerates 5G with 17% Uplift” predicts that 5G adoption will speed up in the US with an approved merger of the number 3 and 4 wireless operators. 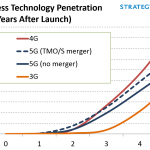 BOSTON--(BUSINESS WIRE)--The Strategy Analytics ’ Service Provider Group new report, “US Wireless Outlook: T-Mobile/Sprint Merger Accelerates 5G with 17% Uplift” predicts that 5G adoption will speed up in the US with an approved merger of the number three and four wireless operators. Along with Dish Network and the cable companies getting into wireless—Comcast gained over half a million subscribers on its MVNO Xfinity Mobile in the first year, and Charter Communications and Altice USA are working on wireless launches—the competitive wireless landscape in the US is heating up as 5G deployments are on the horizon. By 2023, Strategy Analytics forecasts that the merged T-Mobile/Sprint operations will have outperformed the individual operations by almost 1 percentage point market share of gross additions, 0.5 p.p. subscription market share, and 0.4 p.p. revenue market share. Strategy Analytics anticipates that the subscription market share gains of T-Mobile/Sprint will be felt relatively evenly between Verizon and AT&T. 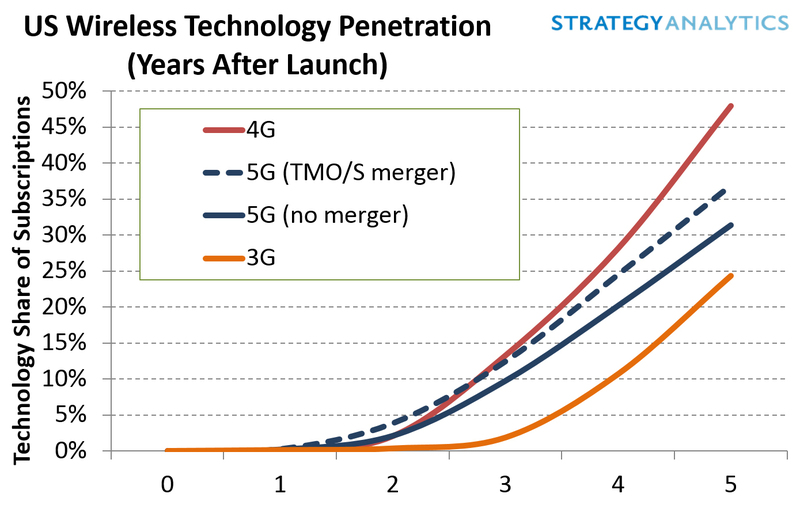 However, Verizon's greater reliance on the postpaid market for its revenue, the market where the accelerated 5G development will be mainly felt in this forecast timeframe, will result in it being marginally more impacted by the merger in revenue terms.